than a re-labeled GE tape deck (model 3-5005b to be exact). be it Smurfs or the Bears. doesn't play\won't play with this set up. The remote access fails to allow the tape deck to start. As soon as the cable is plugged in it will not allow the tape deck to function at all for any use. the machine if the circuit is open or closed. Perhaps it needs to be one of those GE models and this sanyo one just won't do the trick. I do not know. Here is hoping one of you do! That Usenet post sounds vaguely familiar. You might need need to track down an original tape, for some reason I seem to remember that those cassette dumps don't work after transferring them back to tape. Or maybe my memory is going. Ya I have a real tape on the way, it's at a friends house right now. I also had a feeling the tapes wouldn't work copied from that batch of files What I'd really like to see is a video of someone hooking up a kidvid and actually playing with it on a real 2600. Even better someone using an off brand tape deck to do the same job. I've looked and can find no such videos on youtube or dailymotion. Every tape recorder I've owned simply uses an on/off switch for the "Rem" (either on the mic or something like a foot pedal). My TRS-80 Model III has a relay that opens and closes to start and stop the tape deck. If the remote jack just opens and closes a circuit, does the 2600 joystick port have that ability? How much voltage is on that circuit...you may be sending 6 VDC from the tape recorder into your joystick port? Also, does the tape recorder isolate that circuit or does it carry the load of everything, including the motor? I always assumed the Kid Vid had a modified tape deck or some type of interface built into the cable. The remote line is just an on and off that I'm aware of correct. How, when and why the atari closes the loop to allow function I currently don't understand. The kidvid I believe will play even with the remote circuit open. If there is a difference I'm leaning towards that being it but I have no proof or means of testing my theory as my original kidvid is long gone. As for the cable, it's just wires from the remote and mic lines spread out to the atari's second controller port. None of of the 4 connections being to the 5v line. I'm baffled after all these years that the kidvid wasn't totally dissected and documented. I wonder if the patent file would have the info? Might have to look into that I guess. IIRC you have to keep PLAY pressed (and then the Atari switches it on and off). Did you do that? Yes, that is correct. The remote only controls the pause function. Unfortunately yes As soon as the cord is plugged it it no longer allows the tape to play. I'm guessing it has something to do with a change to how the remote line behaves on the kidvid versus a generic tape deck that uses it as a hard pause. If the connection is open it doesn't play, if it's closed it does play. That is how the microphone switch is intended to work on these tape decks. How you can make it play and then pause using the remote line as the kidvid does? That is the mystery for me here. The Atari needs to get info on what game to play from the tape in the first place so if the remote line is open it won't play so it can't send any signal to the atari to let it know which game to start in the first place. that are available are made and modified for the Z26 emulator so these won't work on the real Kid Vid tape deck. i have never had the chance to try out any tape decks if they could be compatible or not. have them, i would rescan them to 600dpi for better preservation. And lastly, the schematic of the Kid Vid cable i did is good since i have made a replica for Sandy Huner back then in 2001.
all three games by flipping certain switches on a 2600 system. Sorry if i can't be more helpful than that. I've made a cable, but I had an actual Kid Vid to use it on so I never had to do a deep dive into the "how does it work?" issue. Looking at the cable schematic, it appears to be using pin 8 Ground for one of the pins. The Atari is switching +5V on/off with respect to ground by leaving that second pin in output mode and alternating between HI and LO. The IO pin is being switched between input and output mode. If pulled LO when in output mode, that would apply 0V to both pins, possibly looking like a closed switch. When in input mode, it would be high impedance looking like an open switch. Something else that I'm not clever enough to reason out. I would test the output of the Atari by measuring the IO pin against both ground (controller pin 8 ) and +5V (pin 7) when the tape is supposed to be active and inactive. If you get no voltage from the IO pin with respect to pin 8 and no voltage with respect to pin 7 then you know that the IO pin is set to input mode, thus providing a high impedance (like an open switch). Otherwise, if the IO pin is in output mode, you'll get a voltage against one of those pins and you'll know it's just switching between HI and LO output states. 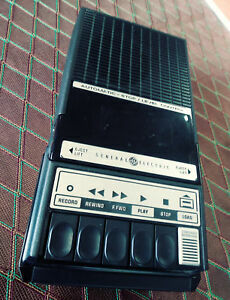 It seems likely that whatever scheme was employed could be adapted with a transistor or something to drive a different type of tape recorder. If you can figure out what exactly the Atari is doing, you or somebody else should be able to use those signals to ultimately drive a simple SPST dry contact relay (using appropriate flyback diode and/or other means of isolation and protection). With that achieved, you would be able to drive nearly any of these tape decks with the "remote" switch no matter what scheme it employs to detect the switch condition. Have you measured for voltage across an open mechanical switch that's "remote" controlling your tape recorder? Maybe it is putting out a voltage and interrupting or passing it through to control the tape motor. This would be the other half of the equation needed to understand why it's not working when driven by the Atari. Have you looked at the internals of the jack that it plugs into? Plugging something into the jack may mechanically break the connection to the motor power. Or, it may be providing ground or something to a more sophisticated circuit. I gave away the last tape deck I had or I'd now be compelled to pop it open and figure out exactly how the remote function worked. Just another thought, polarity of the plug would likely be meaningful so I'd make sure that it was wired per the schematic (assuming the schematic has been proven correct). I'd be very interested in seeing this documentation too. At some point we hope to add this Stella, and having a proper explanation of how it works (rather than having to reverse engineer the z26 code) would be very beneficial. It shouldn't be too difficult to examine the signals from the console and verify by analyzing the disassembled code. I vaguely recall testing my KidVid with the ROMs on a harmony so I think the ROMs function in that environment. My bench is buried in other projects at the moment or I'd try to see what I can see. I helped with the Kid Vid implementation in z26 many years ago. That was no fun at all, especially having to listen to the tape over and over again. This time, I will skip. The tapes for the Kid Vid are actually in stereo, with the music on the right channel and the data on the left one (the audio files available on-line, as slydc said, were modified for use with z26 emulator, and only contain the music, so they cannot be used to make duplicate tapes for use in a real Kid Vid). Moreover, it's stated that you can use the built-in mic and plug an earphone or speaker to the unit, but there's no mention of being able to use external microphone or remote switch, which suggests that the two jacks used to connect to the Atari cannot be used for other purposes. There must be circuitry inside the unit in order to convert the data stored in the left channel as audio beeps to TTL compatible signals that the VCS can see throught the controller port pins, as well as a way to start and stop the recorder using a digital signal coming from the console, instead of the ON/OFF switch required for the "remote" jack of standard players. I believe you are correct. I'm hoping that a kidvid could be analyzed to see what is going on in that difference in circuitry and perhaps be replicated for use with standard tape decks. EDIT: The part about being in stereo I don't think is correct though as the cable itself seems to be mono with only 2 connections from the 3.5mm sound jack. The cable connecting to the Atari doesn't carry audio signals. 4 pins of the Atari controller port are used for the connection and 4 pins are needed on the Kid Vid side as well. To save costs, the case and mechanics of an existing tape deck was reused, so it made sense to repurpose those two existing connectors which, paired, provide the required pins. And while the tapes are in stereo, and the kid vid module has a stereo head, it's not designed to play stereophonic music and therefore doesn't need a stereo jack. The left channel of the kid vid tapes is not supposed to ever be played back as audio, but only to be sent to the Atari, after being converted to a digital signal. Only the right channel goes to the built-in speaker and to the (mono!) "earphone" jack. Edited by alex_79, Thu Apr 11, 2019 9:54 AM. What "sound" comes off of the control channel of the tape? If it's a consistent tone, one might be able to simply feed it into a properly configured one-shot to generate a logic signal to feed into the console (dependent upon appropriate amplitude). Now we are talking While I would still like to have a breakdown of exactly what the kidvid is doing, Going with your suggestion of an independant device doing the same thing would be awesome as well. It would need to be able to generate at least 3 (better if it was 6) different tones to mimic each of the 3 tapes for the Smurfs and\or Bears games. Here are Smurf Saves The Day (see "ReadTape") and a minimally commented disassembly of Berenstain Bears which I did for my analysis for z26. Edited by Thomas Jentzsch, Fri Apr 12, 2019 4:17 PM.